Now THIS is how a woman can dress in all leather and look like a class act. The kinder-starlets should look and learn! "Twinkle was the android radio presenter Mascot for 106.6 Star FM in the Windsor, Slough, Maidenhead area of Berkshire, UK. As well as making appearances at special events and promotions, she also presented the overnight show. 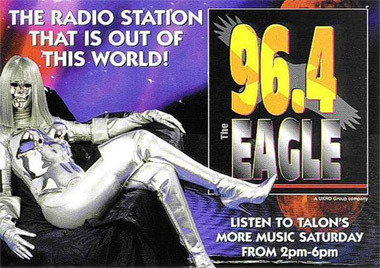 The character was so successful that her "sister", Talon, was built to be the mascot of new radio sation, 96.4 The Eagle which served Guildford and the surrounding area of Surrey and North East Hampshire in the UK. Talon presented the overnight show and a Saturday afternoon show - which achieved the highest audience share on the radio station. Talon's "voice chip" was provided by Dallas radio presenter, Pam Steele. Both Talon and Twinkle are featured in this set. 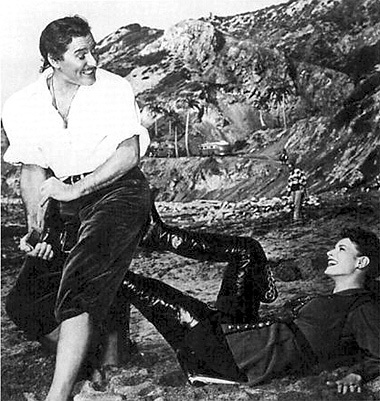 Twinkle and Talon"minders" were often also Talon models themselves." Maniatis Bottier (French, founded 1920). Boots, 1920s. 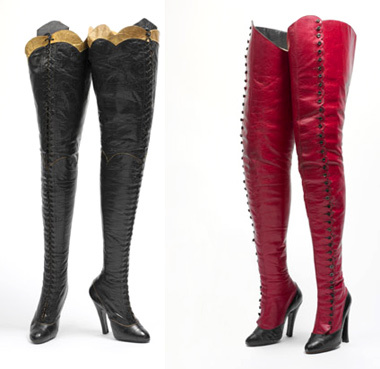 Left: Black leather, gold leather trim, and black twined cotton laces. Right: Red leather with black leather trim. And should an Oceans 11 style break-in at the MET occur in the near future, you all agree to do a collective shrug of your shoulders and agree that Teri would never be the type to do such a thing. Even if she suddenly starts posting from an unnamed South American country. April GQ - Grace Park, Tricia Helfer, and Katee Sackoff of Battlestar Galactica. I'll repost when I find an UHQ copy. Just FYI - for the next 10 days, the first thing that pops into my head upon waking is an on-going mental countdown to the Season Four BSG premiere at 10 pm on Friday, April 4th. Words do not describe my reaction when I found this on the Live Journal 'Battlestar Blog' because it was like a high-pitched squee.